Before Rod Steiger became an unmerciful ham in such legendary howlers as The Amityville Horror and The Specialist, he was a talent of towering strength; one of the rare actors of his generation who could convince you to surrender your very dignity by the mere hint of a simmering growl. His most memorable (and Oscar-winning) performance was featured in 1967’s In the Heat of the Night, but his best – and most nuanced – was 1965’s The Pawnbroker, one of the first (and to this day, among the most powerful) films dealing with the Holocaust. Directed by Sidney Lumet when he still believed in the cinema as a craft and not as a form of prostitution, the film is set in 1960s Harlem, but provides brutally effective flashbacks (edited to approximate Steiger’s shattered memory) to the camps. As Sol Nazerman, Steiger is reserved, bitter, and defiantly unfeeling (understandably, as he lost everything), but so restrained that we sense a boiling rage that spits out on occasion, but never really explodes in full. Sol is calm and dignified in his own way, although there’s no mistaking his unyielding misanthropy, which is best expressed in his blunt retorts to the losers and fools who peddle their worthless wares in his pawn shop. Geraldine Fitzgerald is Marilyn, a woman who attempts to reach Sol through kindness, but is quickly rebuffed in a speech so devastating that it all but closes the book on loneliness. Sol is a man who simply does not want to be embraced, as his experiences have taught him to loathe the world and its infinite capacity to wound. There might be redemption, but he will never be of the mind to search for it. And by the end, Sol does begin to look upon an employee as more than a nuisance, but is rewarded for his brief flirtation with humanity by experiencing yet another painful loss, which brings forth Sol’s lone expression of grief, brilliantly captured as a “silent scream.” It’s gutting to be sure, as we know that Sol has received the death blow to his hellish life. 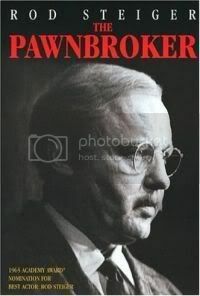 At bottom, The Pawnbroker is a somber, downbeat, wholly depressing slog through the miserable death march of the 20th Century, and as such it shines with the best of the silver screen. There are no blessings in disguise, nor rainbows to be followed, nor blossoming love affairs to cut through the hardship. Instead, there is just a man; a representation of an unthinkable massacre in our midst, but also a single entity that, despite the company he no doubt keeps, feels untethered and so very alone.